Click photo for enlarged view and more photos. What a thrill for us when Randal was doing the annual cleanup for the bluebird boxes. He opened the first one and nearly fell off the ladder when this flying squirrel with large black beady eyes was staring at him. What an exciting day! 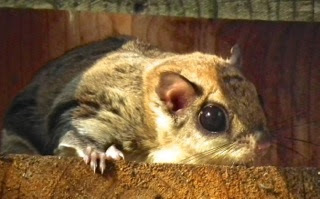 We've never seen flying squirrels here in this habitat. They are nocturnal so its not that easy to see them. We did see one in our Alabama backyard habitat after they clearcut some land behind us. He was hanging in the corner of our back porch, probably terrified, not knowing what to do for a home. I took photos and when I went to put the cap back on the lens it took the opportunity to fly out of the box and up the tree. What was more amazing was that when Randal finished that box and went to the next, he found another one that was curled up with his back to him. I took more photos and it woke up looking for a way to leave, thinking the front opening would work, but Randal stood there. I've put a lot of info on the photos about flying squirrels and about our short exciting adventure. View beginning of the photos here. We decided to go back to Kemper Park to find the two letterboxes that we didn't find on the first attempt back in August. We did find them this time! Yay! More exciting than finding the letterbox was to find a beautiful slug (yes, there are slugs that are gorgeous :-). This one is called a Leopard Slug and is one of the biggest in North America. Click to view enlarged photo. Okay, I know compared to the cute flying squirrel up here, many of you will be gagging on this one, but try to look at it from God's angle and with His creativity and design. This one was hidden under a rock preparing for the winter season I guess. It made me think that we like to "hide out" sometimes when we want to winter over from a hurt or rejection. Life can be cruel, but God is always there to give us hugs and hold us tight when we feel like we're slipping away from the real world. He is ever faithful. Jesus told us we would have troubles in this life, but He has overcome it all, so we need to rest in Him. 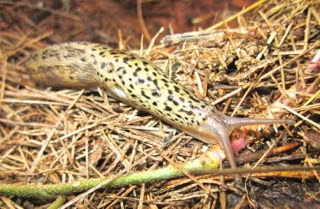 I didn't know that slugs had breathing holes or that they had eyes on the end of those front antennae. I put a lot of information about them on the photos if you'd like to learn more, begin here to view these photos. Click the arrow to the right at the top to see all four photos. Talk about unusual critters, I saw a new bug in our habitat, or at least new to me. There could be oodles of things out there that I've not yet seen, which makes it a great incentive to keep strolling and looking around. 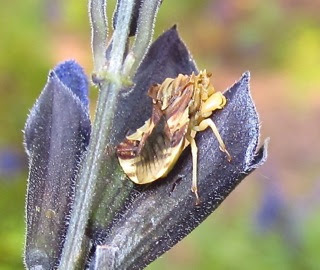 This new one is called a Jagged Ambush Bug. Although considered by some to be a beneficial insect, beekeepers don't consider it so since they eat bees. It's like God put all kinds of left-over parts on this one. A head like a sea turtle and forelimbs like a praying mantis. They lay in wait on or near flowers ready to jump their unsuspecting prey, which may be several times their size. They also seize butterflies and wasps with their strong foreclaws before paralyzing them with their bite. Don't like that part. I painted our front porch shutters with black paint and had many more things I could use the paint on. I continued with the exterior lighting on the house, and then moved to the deck where we have some black aluminum furniture given to us by a neighbor before their move. This year the squirrels decided it was where they were going to file their teeth down. They need to do that or they will grow too long. They used to use the gutters which was fine with us, but for some reason they were attracted to the metal furniture this summer, so it needed quite a bit of paint to cover up all those marks. It's amazing what a bit of paint will do to make things look nicer. I love "keeping house" and being a good steward of all that God has given us. I guess I learned from my grandfather that taking care of what you own is important. And God does tell us" He that is faithful in that which is least is faithful also in much. If therefore ye have not been faithful in the unrighteous mammon (money), who will commit to your trust the true riches?" (Luke 16:11) I've always felt that if you have more than you can maintain, maybe you've got too much. The day after I painted, I noticed a really unusual bug on the bottom of the globe for the light on the front porch. 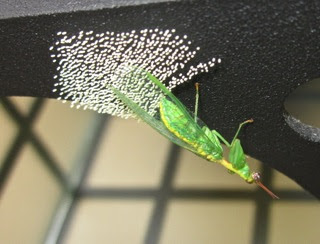 It looked like a cross between a green lacewing and a praying mantid. I got my insect field guide out that my loving son bought me last year and it was very easy to find being as unusual as it is. A Green Mantidfly (Zeugomantispa minuta). They live throughout much of eastern United States and are found in a variety of habitats from late June through early October. Adult mantidflies capture and eat all kinds of small insects in captivity, but little is known of their food preferences in the wild. The larvae are also predators and this particular genus preys on the eggs of spiders. We love our spiders since they are bug-eaters, so not too crazy about that. Seems there's always good and bad in many things we discover, but that's the way it's going to be until Jesus comes back and makes the world right again. It will be awesome to walk around seeing lions lying with lambs and no more "eat or be eaten" mandates in effect. We are very excited that we have a new-to-us beneficial insect though. It's wonderful seeing Creation balance itself out in this fallen state of the world. She was laying eggs in the daytime, although I learned they are nocturnal creatures. View closeup of the eggs. Isn't it amazing how they can space them as they lay them when their eyes aren't even back where the eggs are coming out. God's design of things is simply astounding. One of the things we did here on our Virginia property was to put in a small frog pond. We had one back in Alabama and enjoyed it so much! I love hearing frogs calling and the sound of a small waterfall is nice too. I'm blessed to have a husband willing to dig the hole with a shovel and we're both blessed to have an Alabama friend, Charlie, who helped Randal to concrete it. I've had so many discoveries in the pond. I never knew how alive it was with so many species. Even the insects are amazing. Last month while in the front garden, I saw a plant move and headed that way to see what was happening. It was a small baby frog that had made the leap for an Alianthus Webworm Moth, a moth that looks more like a bug since it's out in the daytime and has wings that fold down like lightning bugs. They are so colorful! I didn't know what kind of frog it was, but I knew I hadn't seen one before in our habitat so I got quite excited. 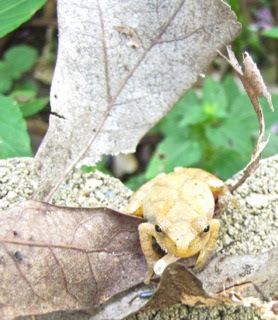 It turned out to be a Spring Peeper. How cool! I hear them every Spring singing a chorus from across the road at the big pond or in our back woods where there's a bit of a ditch. The sound is mesmerizing since it's one of the early signs that Spring has arrived. This is a very small frog with a length of only 3/4-1 1/4 inches (1.9-3.2 cm). The 'X'-shaped dark mark on the back is a great clue. Their coloring varies like the Eastern Gray Treefrog we have here with the belly totally unmarked. They are actually members of the swamp treefrog. Notice how the "Peepers" face is pointed. Very unusual as is the fact that their fingers are unwebbed. This is probably because they frequent shallow pools of water. They mate from April to June here in Virginia, laying 800+ eggs singly on fine grasses or other plants near the bottom of the pool. They eat small insects and other invertebrates. Although I like toads also, they don't live in a pond setting, but they do visit to lay their eggs. I was blessed to see a pair of American Toads mating one year and they didn't seem to mind an audience at all. There was another male getting some exercise swimming around while he waited his turn. As you can see, the male toads are much smaller than the female. That holds true with frogs also. The eggs float for awhile so I was able to take photos of them also. With the American toads, the eggs are like strings of black pearls. The last newsletter mentioned I had stopped the thyroid I was taking because I was having symptoms of taking too much. However, the day after I wrote it and it went out, I decided to go back on it so I could go for the blood test to be sure. Problem is I've had to wait until enough time has passed since I cut it in half, so the test results are correct. The good news is that I will be going tomorrow. I am believing in my heart that my thyroid is healed. I feel like I've reached a standstill in things changing in my health, although I know every cell of my body is being replaced, renewed and restored to God's original design. I love huge, old, beautiful trees that have provided so much for so many years. with all kinds of compartments for snacks, water, wet wipes, tissues, herbal bug spray, etc. 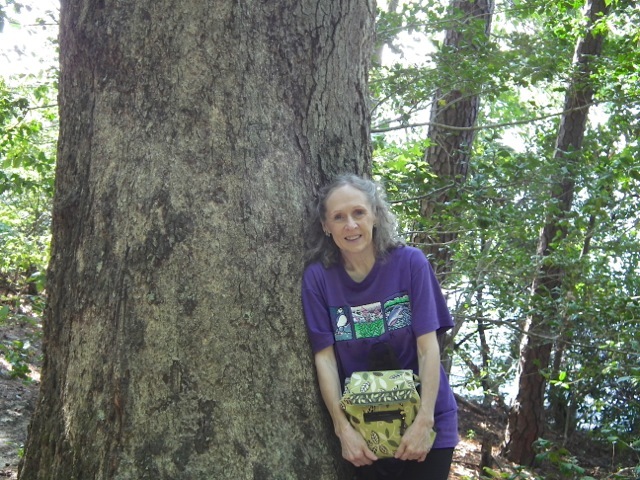 We had a Saturday day trip planned to do some letterboxing in Williamsburg, VA, at Waller Mill Park. There were quite a few letterboxes stashed away on the Bayberry Trail. Photos will follow in next newsletter when I get them put into the gallery, but here's one of me which is the last one with my hair quite long. It was cut a week ago when I had my scheduled botanical perm, Biotera. It lasts me 9 months since the curl never leaves, it just grows out. My hair now doesn't even reach the bottom of my chin. I'll have Randal take a photo before the next newsletter. I've been meditating on Hebrews 6:12 since it is so easy to get antsy and impatient for things to happen with my health. Although I still rejoice and offer up praise and thanksgiving for every detail that has been healed on the heart crisis. I shall never forget the state I was in early this year, so I am grateful for what has been healed, but as anybody with long-term illnesses, I feel like I've already lost a part of my life and I want to "get on with the show," now that I know Jesus provided healing for "all of these diseases." I want to be all that God has planned for me to be. The devil has taken enough and I'm ready to live life abundantly. Hebrews 6:11-12 reminds me, "But we desire that each one of you have this diligence for the perfection of your hope until the end, and that you should not lose heart, but that you would be imitators of those who by faith and patience have become heirs of The Promise" (Aramaic Bible in Plain English). So I am diligent in hope and pursue adding patience to my faith to get all of the Promises that God has provided for us. Thank you for your continued prayers and encouraging emails! You have been such a treasure to my spirit and comfort to my soul.